Barcelona was not its entertaining self but did enough to earn a first-leg win at Old Trafford, while Ajax was bright at home but had to settle for a draw vs. Juventus. 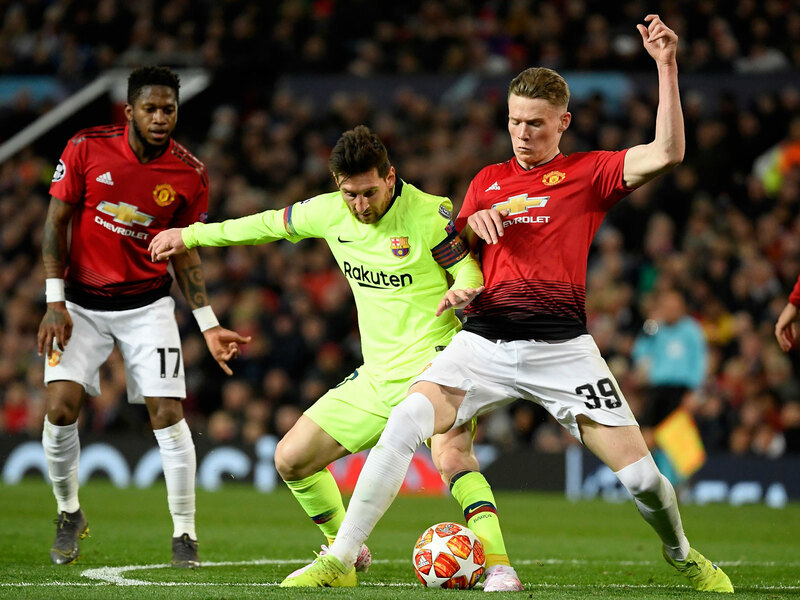 An early own-goal from the Manchester United defender Luke Shaw gave Barcelona a 1-0 lead from the away leg of its Champions League quarterfinal, while Ajax played Juventus to a 1-1 draw in Amsterdam on Wednesday. After an indifferent start at Old Trafford, United improved but without ever really threatening Barcelona. United has never beaten Barcelona away from home but will have to do so if it is to progress to the semifinals. But then, no side had ever overcome a 2-0 home defeat in the Champions League before United ousted Paris Saint-Germain in the last round, and nobody knows better than its manager Ole Gunnar Solskjaer that United has enjoyed one famous 2-1 win in the Camp Nou–that being the 1999 Champions League final in which Solskjaer scored the stoppage-time winner. In the Netherlands, David Neres canceled out Cristiano Ronaldo’s opener–the 125th goal of his Champions League career–as Ajax battled to a draw before their series shifts back to Turin. Manchester United, perhaps, will feel hard done. It had the better of the game. It kept Lionel Messi as quiet as any side has this season. It pressed hard and well, forced Barcelona into mistakes. And yet it lost. The first half had been a curious mix. Barcelona was by far the better side early on, passing the ball slickly, almost taunting United with its possession as it had in the 2009 and 2011 Champions League finals. Its opening goal was a classic Barcelona goal, at least until the moment it flicked in off Luke Shaw. It comprised 48 passes before Sergio Busquets found Messi with a ball over the top. His first touch seemed to have taken him too wide, but when he chipped a cross on the turn to the back post, Luis Suarez headed back across goal. Philippe Coutinho might have turned it in, but the ball was deflected in by Shaw anyway. There was a slightly baffling offside call, but VAR rapidly proved there had been no offense. After that, though, United proved to be the much better side. Barcelona looked unusually sloppy in possession, and Diego Dalot, coming in at the back post, squandered a golden opportunity by heading across rather than at goal. All those doubts about Barcelona, about whether its senior players are a little too senior, about whether its younger players are good enough, were exposed again. But in the second half came a reminder that the issue is perhaps one of perception. Although those early minutes were a reminder of the glory years under Pep Guardiola, Ernesto Valverde’s side is a very different side. Barcelona settled after halftime but sat very deep and, by doing so, frustrated United’s attempts to counter. Occasionally there were little flurries, and Suarez missed a fine opportunity created by Nelson Semedo, but fundamentally this was a team content to sit on a 1-0 lead, something it did with relative comfort. For a long time, it seemed that Scott McTominay’s main purpose in life was not to be Paul Pogba. Jose Mourinho insisted the 22-year-old was the future of the United midfield, but it usually seemed he was picking him to make a point about Pogba. To leave out Pogba and select a senior midfielder might be misconstrued; it had to be an inexperienced player, and that he happened to be resolutely unglamorous (born in the unprepossessing northern town of Lancaster) was a bonus. But McTominay, the burden of being not Pogba removed by the departure of Mourinho, excelled at Paris Saint-Germain in the last round and he showed plenty of quality Wednesday as a hard-working midfielder with a fine range and selection of passing. The comparison with another Scotland international who emerged from a difficult start to become a favorite at Old Trafford, Darren Fletcher, is perhaps too simple, but he may end up fulfilling a similar function. The good news for Ajax is that it has been here before–and that it is better off here than it was at the same stage of the last-16 tie. This felt very similar to the first leg against Real Madrid in the last 16. Again Ajax had the better of the game, again it played with a brightness and joie de vivre and again it didn’t get the win it probably deserved, picked off by a more experienced team on the break. There was, at least, an equalizer, with Neres dispossessing Joao Cancelo to score in the first minute of the second half after Ronaldo had scored with seconds to go in the first. Juventus, though, has been warned. Ajax cannot be relied upon to lie down in the away leg. Juve will not be as complacent as Madrid was, which means Ajax’s chances of progress are vanishingly thin. And that, really, is the sadness for teams of its size. Frenkie De Jong has already agreed to a move to Barcelona, and others will surely follow him out of the door. The lifespan of this Ajax team has been brief and glorious–and it is probably almost over.